Two years ago I moved from San Francisco to work here at Storey in the Berkshire Hills of Massachusetts. One really positive aspect of a country lifestyle, particularly the Storey lifestyle, is an emphasis on do-it-yourself rather than on consumption. I still think it’s valuable to support the individuals and businesses who sell things that are well made and well designed, but when I need a little spice for my wardrobe or home, my first reflex is no longer to shop for it — instead, I think about whether I might make or refurbish something to suit my needs and style. And heck, with the economy in the dumps, it’s become kind of tacky to spend money anyway, which probably isn’t such a bad thing. 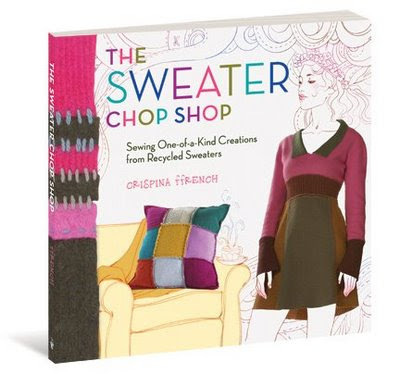 I’ve been writing here on the blog about how I’ve been sewing up a storm using our upcoming book The Sweater Chop Shop by Crispina ffrench as my inspiration. Last week I shared some of the garments I’ve made. This week’s focus is on home décor. Well over a year ago, I bought two gigantic pillows at IKEA for the futon chaise in our family room. Oddly, IKEA didn’t have any shams to fit them, but I figured I would sew something myself. Those pillows sat naked for a very long time, but I’m happy to say I’ve finally finished covering them. 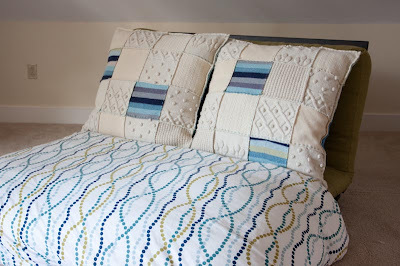 I collected wool sweaters from thrift stores in colors that would coordinate with the duvet cover (also from IKEA). Using the techniques Crispina details in her book, I felted the sweaters, pieced them into squares, and sewed the squares together with yarn. The two pictures below show both sides of the pillows. I like how I can flip them front to back for a totally different look! you can kind of see that above in two of the teal squares. Crispina makes amazing potholder rugs from recycled sweaters too, but that’s not covered in the book since the process requires a loom. She does offer workshops at her studio, though (check out crispina.com), and when she advertised a rug-making workshop, I was tempted enough to take some vacation time to be able to attend all three days and make a 5’ x 7’ rug for my bedroom. 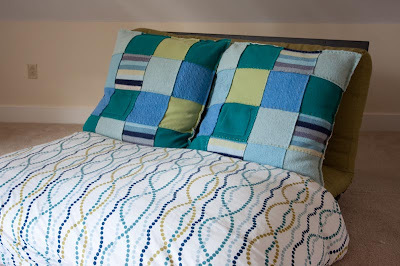 In the warmer months I cover my bed with a Denyse Schmidt cotton quilt, and I used the colors in that quilt as my inspiration. 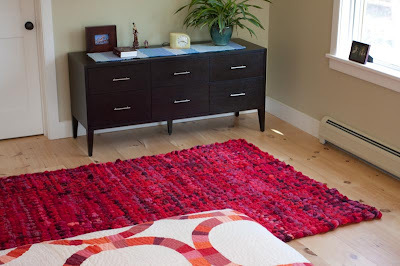 In the photo below, you can see my finished rug and the corner of the quilt that lit me up! 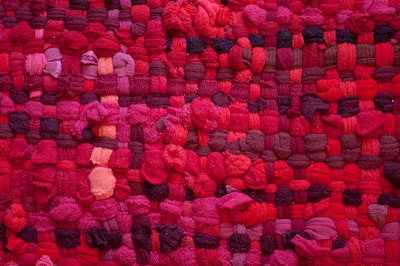 You need about 30 sweaters to weave a potholder rug of that size on a loom, and as it might take me a lifetime to find that many red sweaters at thrift stores, it’s lucky that Crispina has thousands of sweaters at her disposal. My last day at the workshop I had a nibble of time left over, so I madly rushed to weave a couple of seat covers for the two counter stools in my kitchen. The photo below shows a seat cover in progress and gives you a sneak peek at the mini-loom. Making these rugs is easy and fun. As I said last week, I had more fun those three days than I would have had lounging on a tropical beach, and in the end I have something more to show for it than a Mai Tai hangover! 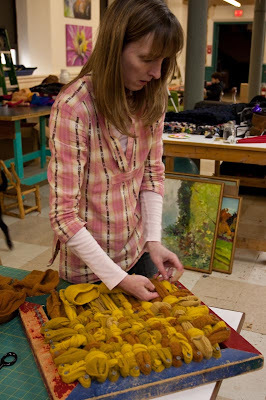 I highly recommend taking a craft retreat, and if you ever want to make one of these rugs, don’t be shy. In addition to local peeps, there were workshop participants with me that came from Arkansas, Missouri, Michigan, and New Jersey! I love your blogs. I made a little stuffed lamb out of a felted jumper cut up and sewn with a blanket stitch. I plan on making another. I will take a picture next time. They make great baby shower presents. Miss you in the bay area.